FILE - People watch a television news screen showing pictures of U.S. President Donald Trump and North Korean leader Kim Jong Un at a railway station in Seoul, South Korea, Nov. 29, 2017. 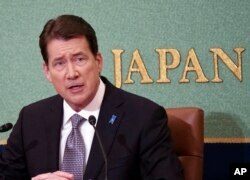 U.S. President Donald Trump has "made a very firm commitment to work as hard as possible to try to return" American detainees and Japanese abductees from North Korea, said William Hagerty, the U.S. ambassador to Japan. "This is a very sensitive issue for us and a high priority for both leaders that was covered extensively," said Hagerty in a telephone briefing that followed a meeting Wednesday between Trump and Japanese Prime Minister Shinzo Abe at Trump's Mar-a-Lago estate in Florida. Abe said Trump had pledged that during his planned meeting with North Korean leader Kim Jong Un, he would raise the issue of Japanese nationals abducted by Pyongyang decades ago. Trump met with the abductees' families in Japan last November during a visit. Three Korean-Americans are currently imprisoned in North Korea. Tony Kim and Kim Hak Song were teaching at the Pyongyang University of Science and Technology, the only private university in the country. They were separately detained in 2017 and accused of participating in anti-state activities and trying to overthrow the government. The third detainee, Kim Dong Chul, was arrested in Rason on the northeast tip of North Korea in October 2015. He was sentenced to 10 years in prison with hard labor in 2016 after being convicted of espionage. Freeing the prisoners would be seen as a sign of goodwill by North Korea's leader. It would also mark a personal success for Trump, who has highlighted the issue. FILE - U.S. Ambassador to Japan William Hagerty speaks during a news conference at the Japan National Press Club in Tokyo, Nov. 17, 2017. Hagerty told reporters that while the agenda of the highly anticipated meeting between Trump and Kim was still "being formed," Washington has "more clarity" in terms of the "direction" in which it will go with Pyongyang. He noted Trump's "intention" to see all of the weapons of mass destruction, including nuclear, chemical and biological weapons, eliminated from the Korean Peninsula. Earlier this month, the Trump administration was said to be looking into incentives for North Korea, including the consideration of establishing a U.S. liaison office in Pyongyang, if the North were to take concrete actions toward denuclearization, according to media reports quoting South Korean government sources. "We are aware of these reports. I cannot go into details regarding internal U.S. government preparations, but a comprehensive, whole-of-government effort in support of the president is under way," said Katina Adams, spokeswoman for the State Department's Bureau of East Asian and Pacific Affairs. "We will do things differently; now is the time for bold action and concrete steps toward denuclearization. In the meantime, the global maximum pressure campaign will continue until North Korea denuclearizes," Adams told VOA, adding that the U.S. was committed to having close coordination with South Korea and Japan on a unified response to North Korea. When asked about the veracity of the reports about a liaison office, Heather Nauert, acting undersecretary of state for public diplomacy and public affairs, said recently, ​"I've seen those reports. I highly doubt that that is something that we would do." FILE - CIA Director Mike Pompeo speaks during the Foundation for Defense of Democracies National Security Summit in Washington, Oct. 19, 2017. Some experts say establishing such an office may be constructive, particularly following CIA Director Mike Pompeo's recent secret meeting with Kim in Pyongyang. 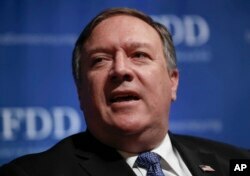 Pompeo's is Trump's pick to become secretary of state. "I think if the Trump-Kim summit occurs and a diplomatic process focused on implementing a deal on denuclearization, it might be useful," Robert Manning, senior fellow at the Atlantic Council, a global affairs think tank in Washington, told VOA. Manning said a Trump-Kim summit would be a "steppingstone" to normalized relations between the United States and North Korea, "which I'm guessing would be part of a resolution of the nuclear issue. It is useful to the degree we have business to conduct with North Korea." Manning, a former State Department official, was involved in planning for a U.S. liaison office in Pyongyang in the 1990s. The move at the time was part of diplomatic efforts to engage North Korea that grew out of the U.S. concerns Pyongyang was trying to attain the capacity to build nuclear weapons. A U.S. liaison office in Pyongyang was first considered and prepared for in 1992 by then-President George H.W. Bush, according to Manning. "The State Department had designated an official to open it, but North Korea backed off. It was considered again in 1996, but Pyongyang, in the end, decided against it a second time, perhaps because of the cost of a D.C. office, and/or reluctance to see Americans poking around in Pyongyang," Manning said. When asked whether a liaison office would be an incentive for North Korea's denuclearization, Hagerty said, "The notion of the liaison office is a very specific tactical result of what I think is going to have to be a broader, strategic discussion. "We're still in the process of establishing the parameters for that strategic discussion."